This book presents the mono dimensional physiological signals (Physical quantities varying over time spontaneously or evoked), two dimensional (Medical images), and three dimensional (Movies revealing inside or outside the human body) that can be collected to unveil its pathophysiological condition as well as systems able of capturing these signals. 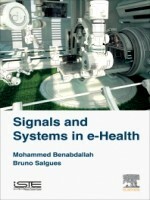 The hardware and software implantation of technical platforms dedicated to the practice of e-health (in particular of Telemedicine) by making contributions of these signals and systems is developed in details. Some augmentative devices deficient physiological organs integrated in Tele medical systems are also subject of this book.